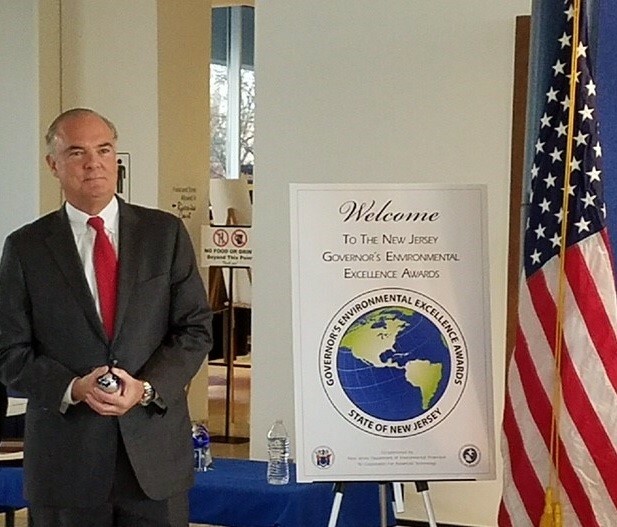 (17/P120) TRENTON – – The Christie Administration today honored a diverse group of environmental stewards for their leadership and efforts to improve their communities through green practices designed to protect the environment. Honorees recognized at the 18th Annual Governor’s Environmental Excellence Awards (GEEA) ceremony at the New Jersey State Museum in Trenton included two Egg Harbor Township teachers whose environmental curriculum helped significantly reduce the school’s energy consumption and costs; a Cherry Hill market that keeps the environment at the forefront of its business model; and a Bergen County hospital system that leverages community partnerships to improve its sustainability efforts. Other award winners included a Gloucester County township that has preserved more than 3,000 acres of land since 2004; a bi-state agency that switched its entire vehicle fleet to biodiesel to reduce emissions and promote clean air; and an Ocean County municipal utilities authority working on a protection and restoration plan for a river watershed that impacts seven communities in two Shore counties. 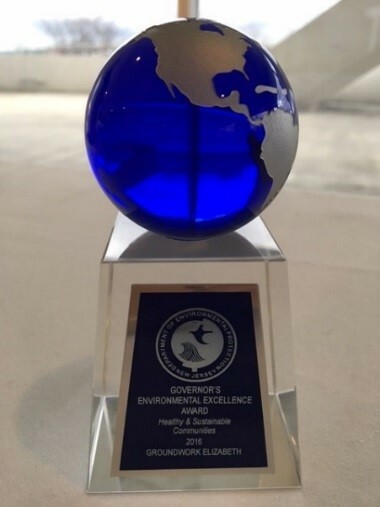 The Governor’s Environmental Excellence Awards are the state’s premier environmental awards program for recognizing outstanding environmental performance, programs and projects in the state. Including today’s event, the GEEA program has recognized 170 winners since 2000. The awards program is sponsored by DEP, the New Jersey Environmental Infrastructure Trust and the New Jersey Corporation for Advanced Technology, in partnership with the New Jersey League of Municipalities. The Port Authority of New York & New Jersey follows a multipronged sustainability strategy that contributes to lower emissions and cleaner air in New Jersey, while also limiting environmental impacts in other areas. The Port Authority’s primary commitment is powering the bi-state agency’s entire 738-vehicle fleet with biodiesel, which cuts greenhouse gas emissions significantly in comparison to petroleum diesel, according to the U.S. Environmental Protection Agency. In 2016, the Port Authority used approximately 26,000 gallons of biodiesel, resulting in a 15 percent reduction in carbon dioxide; 12 percent reduction in carbon monoxide; 20 percent reduction in hydrocarbon and sulfur dioxide; and 12 percent reduction in particulate matter. The Port Authority also partners with other organizations to reduce environmental impacts in other areas, such as reducing bird interactions with aircraft at Newark Liberty International Airport; using environmentally appropriate roofs and solar power at Port Authority facilities; and fighting to protect the federal Diesel Emissions Reduction Act. The agency shares its successes by offering webinars and conferences to discuss emission reduction methods; educating employees about environmentally friendly best management practices; and providing speakers at national events to discuss its biodiesel program. The Brick Township Municipal Utilities Authority (MUA), with input from a broad and diverse stakeholder community as well as the DEP, has developed a comprehensive watershed protection and restoration plan for the 90-square-mile Metedeconk Watershed, which includes portions of seven municipalities in Monmouth and Ocean counties. The plan focuses on protecting and further improving the health of the Barnegat Bay estuary and addressing water quality issues such as stormwater runoff and nonpoint source pollution. Both issues are the main causes of water quality and quantity problems facing the Metedeconk Watershed. The plan outlines specific measures to protect river water quality and flow characteristics as growth occurs during the next several decades. In addition to this plan, the Brick Township MUA has developed a strong working relationship with the DEP that has shown multiple benefits: the MUA is developing a stormwater ordinance that will promote green infrastructure throughout the watershed, and the MUA’s initiatives have led to the discovery, evaluation and cleanup of at least one dozen contamination problems in the watershed. The Pine Island Cranberry Company (PICC) in Chatsworth, Burlington County, has had a DEP-approved Forest Stewardship Plan in place since 2001. This plan has produced successional habitat suitable for quail and other plant and animal species. Because of that success, the PICC was chosen to be used as a study site for a multi-state Northern Bobwhite Quail Recovery Study, in hopes of restoring the Bobwhite population. This population had plummeted to levels of near-extinction in New Jersey and a more than 80 percent decline nationwide in the past 40 years, according to the National Audubon Society. Beginning in 2015, the PICC, along with other study project partners, did the first release of wild Bobwhite brought from Georgia to PICC. Since then, 240 wild birds have been released and tracked at PICC, 39 nests have occurred, 116 confirmed chicks have hatched, birds were confirmed to over-winter from year to year, and confirmed nest successes occurred. The result of PICC’s successful land management methods led to the first-ever federal allocation this year for quail habitat restoration in New Jersey. MOM’s Organic Market in Cherry Hill uses a multi-faceted approach to recycling and green practices, resulting in a company-wide recycling rate of 76 percent for its first year of business in 2016. The store accepts -- for free -- items considered difficult to recycle, and hosts various collection efforts throughout the year to encourage customers to recycle further. MOM’s uses utensils and bags that are 100 percent compostable; paints that are free of Volatile Organic Compounds; and sustainable building materials for flooring, shelving, counters and more. In addition, the store has cut its electrical usage by 60 percent by powering down lighting and other equipment when not in use, and following a policy to never prop open cooler or freezer doors. Motors on the store’s refrigeration systems also alert personnel when leaks occur, which leads to immediate repairs, and recycled hot water is used for heat. The store has two electric vehicle charging stations on its property, and purchases Wind Power Renewable Energy Credits to power the store. There also are no plastic bags in the store -- only reusable and compostable bags. MOM’s keeps its green practices at the forefront with a specialized team that does daily sustainability checks to ensure the store’s environmentally friendly practices and goals are being met. Employees also volunteer regularly in the community for various environmental and stewardship causes. SBM Management Services of Edison, which provides custodial services to 35 commercial facilities covering an estimated 23 million square feet, employs green cleaning strategies that have reduced waste, energy, water consumption and the use of toxic chemicals. In following its strategy of “zero waste,” SBM has diverted nearly 43 million pounds of recyclables from trash and saved $4.3 million in reduced trash disposal costs during its more than 25 years in business. The company also is focused on improved worker health and safety. Its green cleaning program meets LEED certification standards that result in improved indoor air quality and resource conservation. More than half of the company’s equipment inventory is green-certified, and all equipment is LEED-qualified. In addition, much of SBM’s chemicals, paper products, soaps and trash liners are certified as “green” by various organizations, and the company encourages its suppliers to focus on packaging recyclability and waste reduction without compromising cleaning power or product integrity. SBM further enhances its message of sustainability and recycling by training employees extensively on green practices and safety. 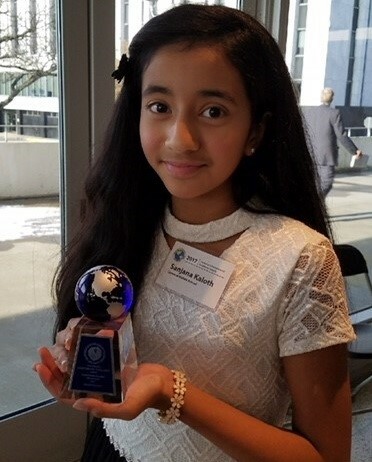 On Earth Day, April 22, 2017, Sanjana Kaloth of North Brunswick in Middlesex County was seen picking up plastic containers, bags and other items from her street and the water detention area in her backyard, a self-initiated activity recorded on video by her mother. Afterwards, an idea was born when Sanjana told her father that it would be wonderful if others did the same in their own backyards and communities so that plastic and trash do not enter storm drain systems that drain to the ocean, posing harm to the marine ecosystem and sea life. Sanjana and her father decided to conduct a contest through a cultural non-profit organization with which they were involved. They invited the public to participate during Environment Day on June 5, and throughout summer vacation, to record their activities for keeping the environment healthy. About 75 people participated, resulting in a sizable collection of recyclables around the state, and creating environmental stewardship awareness with contest participants and supporters. Egg Harbor Township High School teachers Christa Delaney and Jim House have taken environmental education to new levels, turning classroom lessons into tangible results: improved energy efficiency, reduced pollution levels and saved tax dollars. Delaney’s and House’s efforts with students have decreased district energy usage by 35 percent over the past four years and increased the high school’s recycling rate from 700 pounds over a 4-week period in 2012, to 29,000 pounds over four weeks in 2016. These successes were due to student efforts, behavior modifications and basic education. Because of those efforts and others designed to improve overall sustainability, the school has earned several prestigious environmental honors, including Green Ribbon School Awards from the New Jersey and U.S. Departments of Education, two Sustainable Champion awards from Sustainable Jersey for Schools, and U.S. Environmental Protection Agency Energy Star Award Certification. Under Delaney’s and House’s leadership, students have formed an Eco-Action team; audited facility energy efficiency, waste disposal and other environmental impact areas; and instituted environmental-themed curricula. The school also has adopted an outdoor air quality index flag program to promote awareness about pollution reduction and the importance of limiting vehicle idling. Students also have developed a classroom composting program and use the final product in the school garden and in lab activities across multiple fields of study. Delaney’s and House’s students also apply their lessons at home: Egg Harbor Township High School offers a free service called GreenQuest that encourages township residents to analyze their personal impact on the environment and see how their homes compare to others in the area. This Gloucester County township preserved 917 acres across 23 properties during the first eight months of 2017, bringing to more than 3,000 the number of acres protected since the township enacted an open space tax in 2004 and a Transfer of Development Rights program in 2008. Woolwich Township, which once made national headlines as being the fastest-growing community in the Northeast, has taken significant steps to target farmland preservation, forestalling the construction of 690 approved or proposed residential units from the largely rural community. Of the land preserved this year, all but two properties are private farms that will remain private, in perpetuity. The other two will become municipal parkland for conservation and recreation purposes. Many of the properties protected this year also will directly benefit state wildlife and conservation goals. Some of the preserved properties border and buffer important tidal tributaries to the Delaware River, helping to protect woodland, coastal bluffs, grassland meadows and emergent wetland habitat. In total, Woolwich Township has connected more than 1,000 acres of farmland in a contiguous greenway of preserved land, benefiting wildlife habitats and providing economic viability to the community’s growing agricultural industries for farming and agritourism. Additionally, the township plans to preserve an additional 2,600 acres of farmland and open space through its Open Space and Recreation Plan and Public Spaces Plan that was adopted in 2016. Hackensack University Medical Center has transformed itself into a model campus of sustainability through a variety of actions including significant increases in recycling tonnage, providing farm-fresh foods for patients and staff, and equipment improvements that reduce energy consumption hospital-wide. After merging with Meridian Health in 2016, Hackensack University Health Network began doing baseline assessments for each hospital in its expanded network. Various initiatives include partnerships with PSE&G and local schools; green-focused purchases for furniture; and a focus on use of safer chemicals. A partnership with regional educational institutions to share best practices with other health care systems and companies in New Jersey became so successful that hospitals in New York and Pennsylvania began participating in the discussions. Further, the hospital has expanded its educational outreach on sustainability by lecturing at Ramapo College’s Sustainability and Environmental Science courses, to teach the next generation about environmental stewardship. Sustainable Jersey provides input to local governments, schools and districts on how to make their communities better environmental stewards by increasing and improving sustainability efforts to reduce pollution and waste, increase recycling, cut greenhouse gas emissions, stimulate local economies and improve resiliency. The organization also works on issues involving land use, local purchasing, environmental justice, brownfield sites, and sustainability and resource conservation. Accordingly, the program this year has provided $762,000 in grants to municipalities, school districts and schools to support community sustainability projects. More than 200 “green teams” also have been established statewide to work on sustainability certifications. Sustainable Jersey has a 79 percent participation rate in its certification programs, which translates to 445 of New Jersey’s 565 municipalities, 274 school districts and 681 schools. In addition, Sustainable Jersey annually hosts a Sustainability Summit that brings together more than 300 people for discussion sessions on topics ranging from environmental philosophies to best management practices to citizen engagement. The result of the summit is an annual report that frames sustainability progress statewide. The College of New Jersey installed five Level 2 charging stations in the commuter parking garage used by students and faculty. The college promoted the new charging stations to persons using the parking area by survey and through an article in the college newspaper. They also promoted the new charging stations to the public through features in the Trenton Times, NJ News, and the Philadelphia ABC Affiliate, Channel 6. 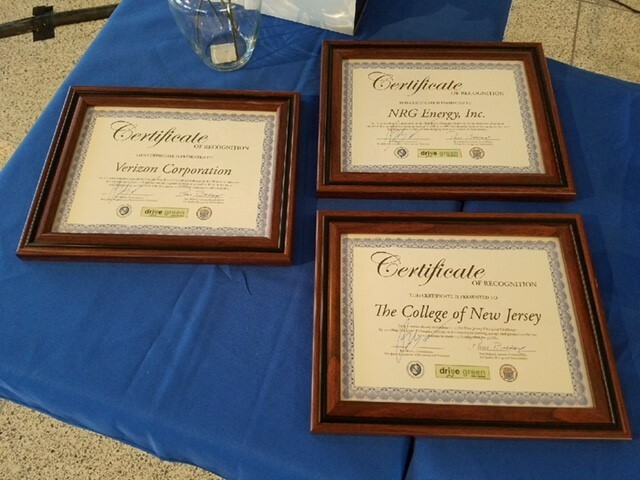 The addition of these stations adds to the five similar stations the college installed last year and which earned the College of New Jersey its first Charging Challenge Certificate of Recognition from DEP. NRG Energy, Inc. installed two single-port and seven dual-port Level 2 charging stations as well as two DC Fast Charging Stations for employee use at their 804 Carnegie Center building in Princeton, Mercer County. During the past year company representatives have given 29 building tours for other company representatives that highlight NRG Energy’s new electric vehicle charging stations. Verizon Corporation installed one single-port and 13 dual-port Level 2 charging stations in parking areas at several Verizon facilities throughout the State. To promote these new technologies, Verizon circulated announcements to employees about the charging stations; hosted “green bag webinars” for employees that focused on all green commuting options, including EV charging; hosted a Green Commuting Tree Planting Program, whereby a tree will be planted for every employee who signed up to be a green commuter; and tweeted about the new EV charging installations to more than 7,000 followers on Twitter. Verizon also committed to installing additional charging stations on their properties in 2018.